Brand Financial Training > AF4 > What is the Balance of Payments? Questions on economics often come up in the Diploma and Advanced Diploma investment exams, and the CII manuals don’t always seem to go deep enough into a subject. The balance of payments of a country is the record of all its economic transactions with the rest of the world. These are transactions made by us as individuals, as well as companies and the Government. This flow of money between us and the rest of the world is measured in the capital account and in the current account. The capital account is a record of the net change in ownership of financial assets such as shares, bonds and loans and physical assets such as land and buildings. If the capital account is in surplus, this means that foreign investors are bringing more money into the country than we are sending overseas. This effectively means that foreign investors are increasing their ownership of national assets. If the UK has a capital account deficit, it means that investors are sending more money overseas than is coming into the UK, which means that we are increasing ownership of foreign assets. The current account records the amount of money the UK is earning – in other words the difference between what we are exporting and what we are importing as well as what we are earning from overseas investment. Visible imports and exports are things like cars, computers and clothes, whilst invisible imports and exports include services such as tourism and financial services, so when tourists arrive in the UK and spend their money, this will be recorded in the UK current account as an invisible export. The difference between our exports and imports is known as the balance of trade. If the UK exported more than it imported, then we would be running a trade surplus. The balance of trade in the UK is reported by the Office for National Statistics (ONS), and since 1998 the UK has been running consistent trade deficits (more money going out than coming in – or importing more than we’ve been exporting). This is mainly due to an increased demand for consumer goods (clothes, cars, computers being imported) and a big decline in UK manufacturing. This deficit in goods is partly offset by a surplus in services (for example, finance and other services), but it is not enough to overcome the deficit. Having said that, according to latest ONS figures, the total UK trade deficit narrowed £3.2 billion to £2.9 billion in the 3 months to September 2018, due to increases in exports being larger than imports across both goods and services with both EU and non-EU countries. 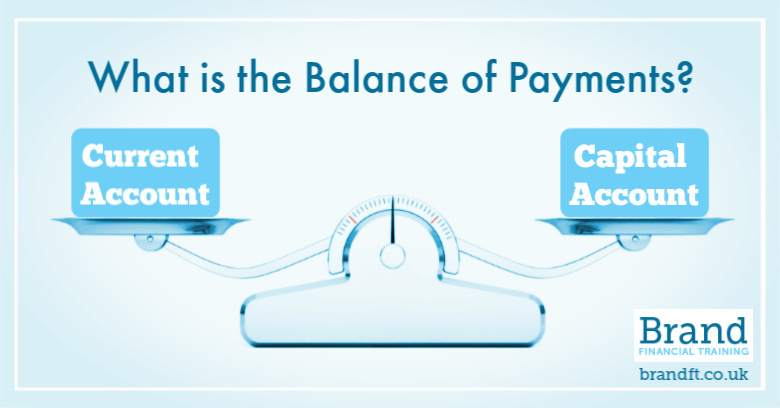 The capital account and current account should always balance each other out. With a current account deficit there should be a surplus on the capital account. One way of dealing with a current account deficit is to devalue the exchange rate – this would make exports cheaper and imports more expensive leading to a fall in demand. This would (in theory at least) improve the current account deficit. If you’re studying for your CII R02 exam, and you’re starting to get anxious at the thought of sitting the exam, grab our free taster to try out one of Brand Financial Training’s mock papers for yourself. Click the link to download the R02 mock paper taster now! Alternatively, you can download any of the taster mock papers for J10, J12 or AF4 if one of those exams is causing you worry.